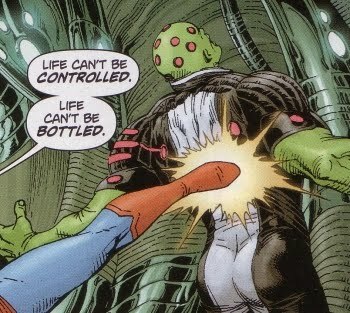 Superhero Sayings: Life can't be controlled. Superman is in the midst of an epic battle with the new and improved Brainiac. Brainiac has downloaded more information than he knows what to do with into his head and thinks that he can control life if he enslaves it. This is a well written trade collection exploring the differences between the human mind and spirit versus that of an artificial intelligence. In daily life we often try to bottle and control things by trying to understand how everything works or making sense of time by putting all of our activities into our smartphones or PDAs to keep track of things but often we find that we can't stick to those schedules because "life happens" and unforeseen events throw us off course. This is what makes life worth living as it's the variety and undefined future which makes us feel alive and full of possibilities! References: Taken from Superman Brainiac HC (ISBN: 978-1-4012-2087-7) by Geoff Johns (writer) and Gary Frank (artist). Published by DC Comics.